I'm a big fan of Alice Medrich's Bittersweet so when her new book, Pure Dessert , came out several months ago, I knew I had to get myself a copy. Even though I was drooling while eagerly flipping through it upon its release, it wasn't until this past week that I finally got around to trying one of the recipes. Given the number of must-try recipes in this book I was hard pressed to pick just one. 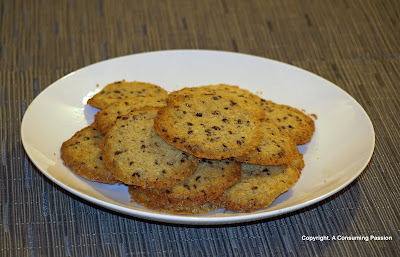 Ultimately, however, I settled on what I think are healthier cookies - whole wheat sables. In truth they are just as laden with butter as any other cookie but the dough is half made of whole wheat flour and whole wheat is good for you, isn't it? Instead of just making plain sables, I chose to use one of the suggested variations and added cacao nibs to my cookies to add a delightful crunch. Even as the cookies were baking in the oven I could tell from the buttery aroma that permeated the air that these were going to be good. In her book, Alice Medrich describes them as "meltingly tender, butter cookies with the nutty flavor of whole wheat" and they were exactly as advertised. Fresh from the oven my cookies were, thin, crispy, crumbly and mind-blowingly buttery. They are supposed to be even better the next day but the cookies almost didn't last till then. Thankfully I managed to restrain M and myself from eating them all so that we had enough to serve as a welcome treat for M's brother and his wife who were visiting from New York the next day. Position a rack in the lower third of the oven and preheat the oven to 350F. Line the baking sheets with parchment paper. Whisk the all-purpose and whole wheat flours together. Set aside. In a medium bowl, with the back of a large spoon or with an electric mixer, beat the butter with the sugar, salt and vanilla for about 1 minute, until smooth and creamy but not fluffy. Mix 1/4 cup cacao nibs into the creamed butter. Add the flour and mix just until incorporated. Scrape the dough into a mass and, if necessary, knead it with your hands a few times, just until smooth. Form the dough into a 12 by 2-inch log. Wrap and refrigerate for at least 2 hours, or, preferably, overnight. Position the racks in the upper and lower thirds of the oven and preheat the oven to 350F. Use a sharp knife to cut the cold dough log into 1/4-inch-thick slices. Place the cookies at least 1 1/2 inches apart on the lined baking sheets. Bake until the cookies are light golden brown at the edges, 12 to 14 minutes, rotating the baking sheets from top to bottom and fron to back halfway through the baking. Let the cookies firm up on the pans for about 1 minute, then transfer them to a rack with a metal pancake turner and let cool completely. The cookies are delicious fresh but are even better the next day. They can be stored in an airtight container for at least 1 month.